What has been going on? There has been zero response to any of the questions posed by the media. The only thing we have been told is Loxam yelling at us about what a great job he thinks he’s done. No future plans – just more of the same. Dictatorship is the only form of government they intend on imposing. Jim Elliott Why would this board wait until after the election? It’s not a case of the board having to make a decision to proceed or not. The contract has already been awarded. Perhaps it has more to do with “damage control” for the misleading statements by Loxam at the all candidates meeting when this question was asked.Maybe the chair will step up and inform the land owners of our finanacial liabilities. I would also hope that a proper five year financial plan will be presented. We seem to be riding on the dream that the develoment will rescue us. I challenge anyone to find an area that has grown and the taxes have gone down ! I do fully support buiding the water plant but tell us the truth about the costs! At last years AGM the admin couldn’t answer financial questions and it looks like the landowners are going to be kept in the dark about the costs of the water treatment plant. We are locked out, have a board who simply refuses to respond to media questions or landowners questions, wants you to praise them for their wonderful work and never be so bold as to demand answers. Dictatorships are not known to be accountable. 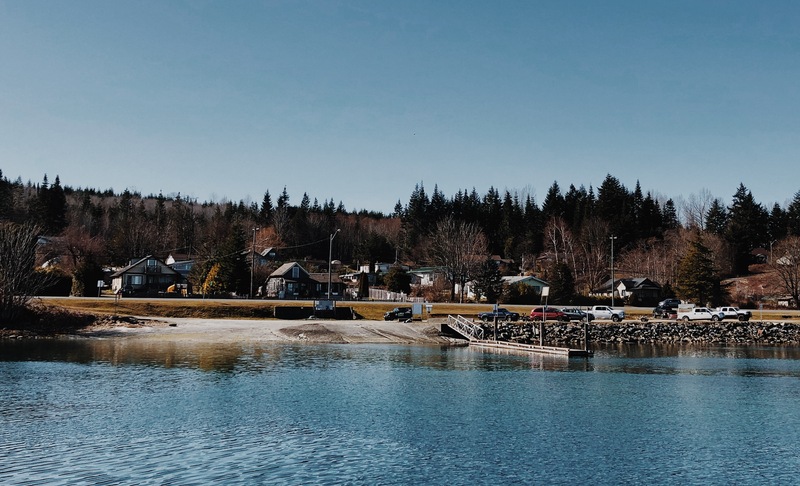 UNION BAY, B.C- The exact parcel tax amount that Union Bay residents will pay for their new water treatment plant won’t be known by the public until after the election. 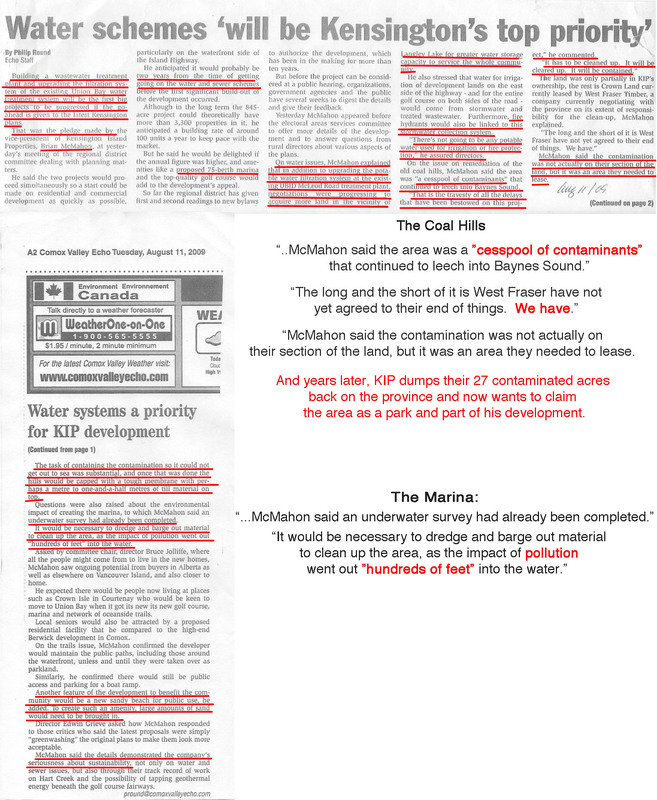 That’s according to the administrator of the Union Bay Improvement District (UBID), Gordon Mason. 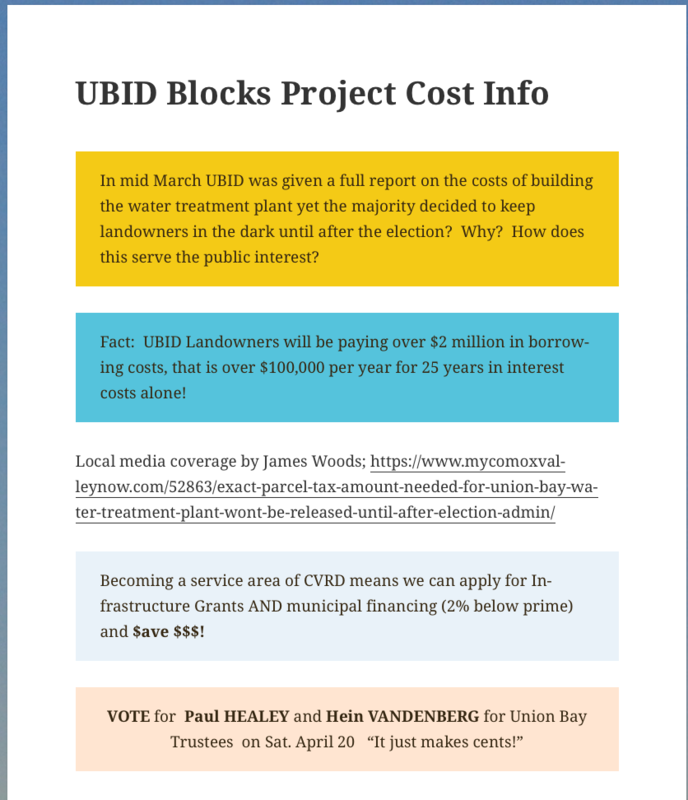 The district has already put out a press release, indicating that parcel taxes for Union Bay will be going up by $46 in 2020, to a total of $391, in order to pay for the plant. 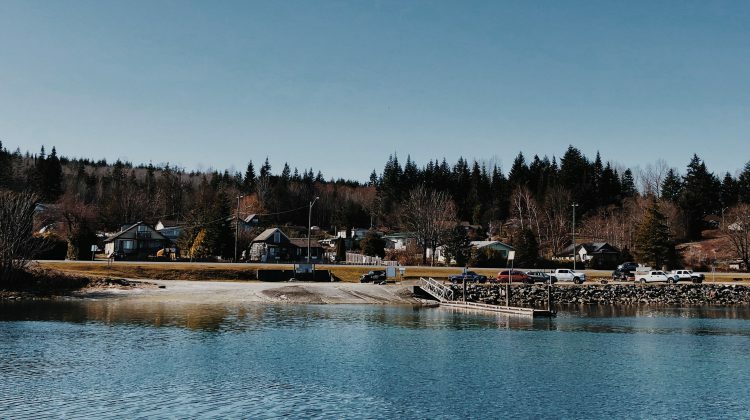 The total cost of the water treatment plant project is $4.2 million, with the district stating that $700,000 will be contributed from their Public Works Capital Reserve, and another $3.5 getting borrowed and amortized over the next 25 years. However, the press release does not indicate how much of that $391 will be going towards the water treatment plant costs. Asked for that amount, and whether or not any other services provided by UBID would be financially impacted by the treatment plant costs, Mason said the information being sought was part of a business case supplied to district trustees “in-camera”. 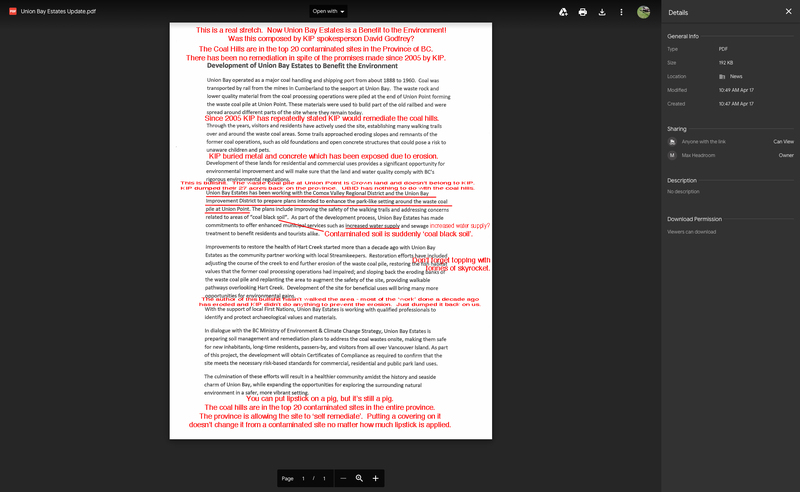 “This information is considered confidential and has to be approved by the board for release at an in -camera meeting in the near future,” said Mason, in an emailed response. Asked if the additional $46 would be the only funds going towards the water treatment plant from parcel taxes, or if that hadn’t been determined yet, Mason said he couldn’t release that information until he had board approval. A request for comment has made to UBID Chairperson Ted Haraldson on the matter.